The Chicago Blackhawks have made history as the first team NHL team to start a season with the first five games going to overtime. This has resulted in a promising starting record of 3-0-2. Although five games don’t sound like much, a strong start was necessary for the Hawks to get back into playoff contention. A lot occurred over the first five games, but here are five of the biggest takeaways and what they say for the rest of the Hawks’ season. The Hawks struggled the entire 2017-18 season to find a consistent offensive line. Since the departure of Artemi Panarin and his lethal scoring alongside Patrick Kane and Artem Anisimov, there has been no consistency in dominant offensive lines. Fortunately, it appears that it’s about to change. They are no Panarin-Anisimov-Kane, but the first line with Dominik Kahun, Jonathan Toews, and Alex DeBrincat have been a scoring powerhouse in the past five games. Both Toews and DeBrincat have five-game point streaks while Kahun’s streak is currently at three games. Out of the 22 goals scored for the Hawks so far this season, the first line is responsible for 12 of them. All three players deserve credit for their line’s success, but Toews’ resurgence seems to have created a positive domino effect for the Hawks as a whole. With the best start of his career, Toews has tallied five goals and four assists so far this season. DeBrincat praised his linemate and captain last week to the Chicago Sun-Times, “He’s been great for us on the bench. He’s playing with two younger players, and sometimes that can be frustrating for him, I’m sure. He’s good with staying calm on the bench, directing us and telling us what we can do better and what we’re doing right. He’s definitely the leader of the team and the leader of the line. He’s really helping us as we move along here.” (from “Blackhawks winger Alex DeBrincat off to fast start playing with Jonathan Toews”, Chicago Sun-Times – 10/10/18). If the first line sticks together and continues with their current success, they could be the key to the Hawks getting back into playoff contention. 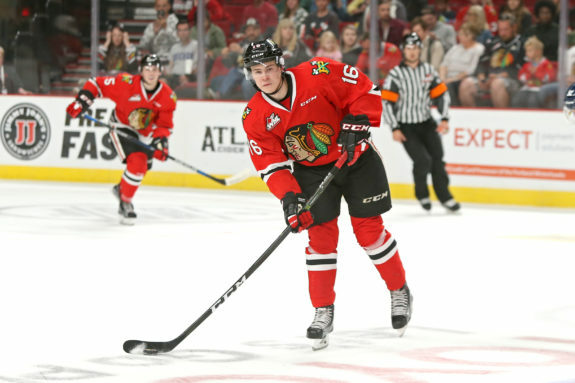 It’s no secret that the top rookie for the Hawks is currently 19-year-old defensemen Henri Jokiharju. He has yet to tally his first NHL goal but leads the team with five assists. After only three regular season games in a Hawks sweater, it looks like Jokiharju proved him right, as Quenneville told the Chicago Sun-Times, “I like his competitiveness. I like his poise and patience for a youngster. He’s only going to get better in how he’s going to read situations, play around his net in his own end. But I like how he wants the puck. He really has good patience and good play-recognition. He complements Duncan Keith in a lot of ways. He breaks out on some tight-coverage plays coming in off their forecheck. Seems to get some relief with direct plays exiting as well. So it’s been definitely a good start for him. I think he’s going to be in a lot of games back there.” (from “With Q seal of approval, Blackhawks rookie Henri Jokiharju might be here to stay”, Chicago Sun-Times – 10/8/18). Jokiharju has proved to be a force to be reckoned with in his first few games, tallying the most ice time out of any rookie in the league, averaging over 20 minutes a game. If this is just the first few games of his first season, he is sure to be one of the most exciting rookies to watch and a great NHL career ahead of him. Despite a promising starting record of 3-0-2, there are plenty of weaknesses with the Hawks. Although the defense has improved from the abysmal 2017-18 season, there is much more room for improvement. The offensive end has thrived with scoring a total of 22 goals in the past five games, but the Hawks have also allowed 21 goals to pass through the net. It seems that when the Hawks leave their own zone, trouble is inevitable. Fans and analysts alike have noted that the Hawks need to stay in their own zone if they want their first regulation win of the season, which is always ideal. However, spending time in the opposing team’s zone is unavoidable, and everyone on the Hawks’ roster needs to step it up the second they cross the blue line. Prior to the start of the regular season, I wrote a piece on the importance of Toews, Duncan Keith, and Brandon Saad making comebacks this year. While Toews has exceeded expectations and Keith is improving, Saad has been a disappointment with only two assists in five games. Fans have noticed that Saad is trying to score but having no success. 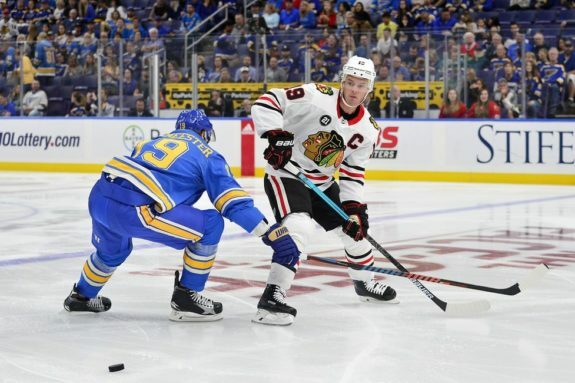 He was demoted from his second line position alongside Patrick Kane and Nick Schmaltz before the game against the St. Louis Blues on Saturday and is expected to be a healthy scratch during Thursday’s game against the Arizona Coyotes. 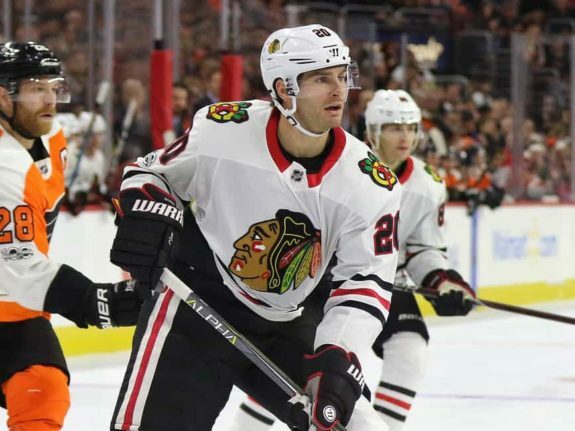 If Saad is a healthy scratch come Thursday, it will be a forewarning that his position on the Hawks’ roster is not guaranteed. If he continues on his current path, Saad’s days in a Hawks sweater are numbered. As mentioned previously, goaltender Cam Ward has failed to stop 21 goals in the last five games. It sounds like a lot, but the 34-year-old goaltender is exceeding expectations. Luckily for Ward and the Hawks overall, his performance with Wings appears to be a distant memory. In his first five regular-season games in a Hawks sweater, Ward has faced a total of 173 shots on goal and has stopped 152 of them. Corey Crawford is likely to resume his position of starting goaltender in a matter of days, but Ward has proven himself to be reliable. 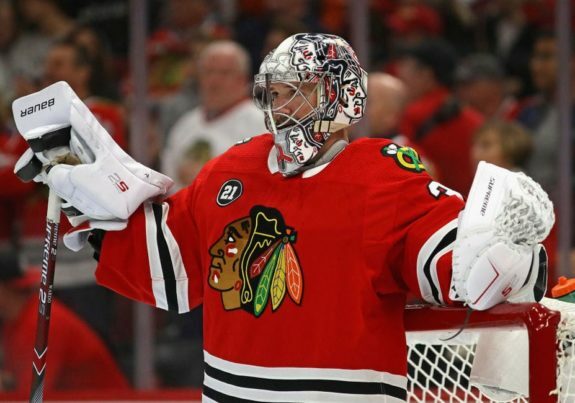 If Crawford’s return is successful, Ward will make for a solid and dependable back up goaltender. All stats are obtained from NHL.com.